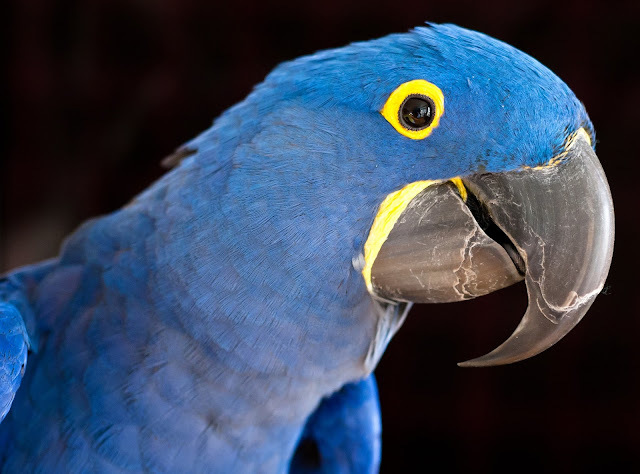 The Zen Parrot: Of Parrots, Politics, and Coffee: Princess Tara Chronicles: Blue Tara; Or, How Is a Hyacinth Macaw Parrot Like a Tibetan Goddess? Princess Tara Chronicles: Blue Tara; Or, How Is a Hyacinth Macaw Parrot Like a Tibetan Goddess? I originally got a parrot because an old black guy with parrots told me it would help me pick up chicks. And I don't mean the poultry kind. Picked out a parrot at this old black guy's bird store here in Seattle that was big, blue, and loud. And a princess. The loudness I didn't learn about until it was too late. But that was the least of my problems. First of all, turns out I didn't actually pick out the parrot. The parrot picked me. Not only was the parrot big, blue, and loud. And a princess. The parrot was a witch. Not a figurative or allegorical witch. A literal witch. A witch of the spell casting kind. The abracadabra kind. A witch with a coffee addiction. Once I entered the bird store the parrot cast a spell. The kind of spell that caused me to open my wallet for a big, blue, loud witch. The kind of witch that didn't abide with girlfriends. The kind of witch that didn't abide with not getting her way. The kind of witch that turned out to be my guardian angel and a proverbial albatross around my neck at the same time. A witch named Princess Tara. Driving makes me hungry. Driving up Aurora Avenue in North Seattle I craved a cookie. Any kind. I just wanted a cookie. I wasn't particular when it came to my cookie obsession. I pulled into the PCC parking lot. PCC. Puget Consumers Cooperative. One of the many lefty cooperatives that sprung up around Seattle back in the fifties and sixties of the last century. Like geoducks after a hard rain. Maybe not like geoducks. Geoducks aren't flora. Or fungi. Geoducks are giant mollusks. The macaws of the mollusk world. I like to throw geoducks out in conversation because what separates true Seattleites from the countless immigrants flooding the city to work at Amazon or Starsucks or Microsoft is knowing how to say geoduck correctly. But back to cookies. I just wanted a simple cookie. Oatmeal raisin. Chocolate chip. Gingersnap. Didn't matter. I have a weakness for cookies. I admit it. Snickerdoodle is my favorite. And PCC makes one of the best snickerdoodles in Seattle. I parked and walked up to the door thinking cookies. Suddenly I started thinking parrots. Guy standing at the door stopped me. He was hard to miss. Besides the fact he was standing in the doorway blocking my entrance. A stunningly brilliant blue and yellow parrot perched on his shoulder. Properly called a Blue and Gold macaw (Ara ararauna) I learned later. One of the largest and most brightly colored of the macaws. Hard to miss. Especially when there's one right in front of you perched on a guy's shoulder blocking the entrance to the store that sells the cookies you're currently craving. On this day I knew nothing about parrots. I'm an historian. Got a Ph.D. in history. And another Ph.D. in archaeology. So I know Ph.D.s. I've gone through life collecting academic degrees like some people collect cars. I've got a bunch of them. Bachelor's. Master's. You name it. Certificates I can't even remember now. Pretty useless. I never enjoyed a particularly stellar academic career. I wrote a lot. Mostly reports people never read. Published some. Traveled for research and field work. I had my ups and downs. Mostly just downs, now that I think about it. I could never achieve tenure, so I bounced around living out of a suitcase as an adjunct professor. Idaho, Oregon, Alaska, California. Finally Seattle. But it kept me from making pizzas or washing dishes for a living. Not that I didn't make pizzas or wash dishes while I was collecting my degrees. But don't get me started. I can regale you with countless stories about Seattle history until your eyes glaze over. But parrots? On this day, the day I had my heart set on a cookie, I didn't know a damn thing about parrots. Sure, I knew people with parrots. Knew one guy who even went everywhere with his service parrot perched on his shoulder, to the gas station, grocery store, everywhere. But he's strange. People with parrots seem stranger than most. Occasionally see people walking around the Ballard Farmers Market in my Seattle neighborhood with their parrots on their shoulders. My mom had parakeets when I was growing up. Remember them fluttering around the house and landing on my head. Mostly I remember them pooping in my hair. Then mom would make me wash my hair out after she corralled the parakeets back in their cage. My early association with birds was not uniformly positive. Back to the guy with the parrot perched on his shoulder, standing between me and a cookie. Had never seen this guy before. Had never seen such a gorgeous creature before. Not the guy. The parrot. Stunning. Stopped me in my tracks. And what's really strange. This guy. This guy with a large colorful parrot perched on his shoulder. Someone I've never seen before. He gets between me and my cookie. I mean, he literally put his hand out to stop me. I almost ran into him because I was so focused on my cookie. This guy put his hand out to stop me and said, "There's a blue parrot at Charlie's Bird Store you need to see." Charlie's Bird Store occupied part of the catacombs in the lower levels of Seattle's Pike Place Market off the downtown waterfront. Several floors below the standard tourist haunts. The flying fish. The flower mongers. The Russian bakery. Did I mention cookies? The geoducks. The brass pig. Down the block from the first Starbucks ever. And it goes without saying, every time I visit Pike Place Market I have to pick up a chocolate pretzel at Three Sisters Bakery. Chewing a chocolate pretzel, I patted the brass pig on his snout for good luck while heading for the top of the Pike Place Hill Climb. The flying fish and brass pig and chocolate pretzels were a good 200 feet above Seattle's sea wall. And only about 200 feet away. Straight up. And straight down. But the thing about parrots is, just follow the squawking. I could hear the parrots well before I found the shop about half way down the hill climb. Charlie's Bird Store is gone. Part of Seattle history now. A legend and foundation story for many Seattle bird people. Charlie’s an eccentric elderly black guy. Tall. Wiry. Old school. Fancied himself to be a bird whisperer. A born salesman. Today, if it wasn't parrots he'd probably be running a pot shop. Back then it was parrots. Charlie retired after all these events were said and done. Told me he had gone one parrot too many. One particular parrot too many. The closing of Charlie’s Bird Store was big on the local news, Charlie being the celebrity he was. Turned out to be quite the show when hundreds of birds needed to be moved out to new digs. "Come In" the sign read on the door to the shop. I took a deep breath and pushed the door open. The din of hundreds of birds, parrots, parakeets, and God knows what else rolled over me like the tide at Golden Gardens beach. I thought I heard someone say "Hello." I paused in an attempt to acclimate to the noise level. Hundreds of birds. Small birds. Big birds. Loud birds. Parakeets, lovebirds, cockatiels, conures. I thought maybe retreat might be my best option. "Hello." I definitely heard it that time. Toward the back of the shop. Low ceiling, brown concrete block walls, one bank of dingy floor to ceiling warehouse windows facing the water. In another room toward the back I could see larger birds. African Greys. Cockatoos. And the macaws. But no sign of Charlie. "Hello." Adjacent to the door to the back room stood a stainless steel floor to ceiling cage containing the largest bird I had ever seen in my life. Blue. Cobalt blue from the crest of its big head to the tip of its long tail. Only parts of the parrot not blue were the gigantic black beak and glowing black eyes. If black eyes could glow. And these black eyes glowed. That and the reflector yellow highlights around the eyes and lower mandible. "Hello," the parrot said. Indisputable. I stood in front of it in awe of its color and size and heard it clearly over the din from the front of the shop. I responded, "Hello." That was it. That was all it took. I was entranced. I reached my hand out toward the parrot. "Hello boss." Charlie grabbed my shoulder from behind me and firmly pulled me back from the cage. "300 pounds per square inch. 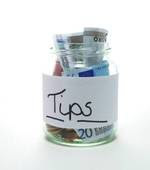 Only takes 15 pounds per square inch to take your finger off." Boss? How do you respond when an elderly black guy calls you Boss? This is the socialist hellhole of Seattle, not South Carolina. "You looking for a parrot? You come to the right place." 300 pounds per square inch? Great sales pitch I thought. I tried to figure out how to respond. I was in a parrot store looking at parrots. Of course I was looking for a parrot. "Hello." "What ya know boss?" Charlie said as he stepped to the parrot's cage. "Tara here has never said two words to anyone before. She likes you." I stepped closer to Charlie to hear him over the din of whistles and squawks and shrieks that reverberated around the concrete walls of the shop. "Well, it's one word actually. She just keeps repeating it. She probably hears it from every customer who walks in the door. Parrots don't actually know what they're saying, do they?" "Tell the truth boss, most customers scared of her beak," Charlie said. I haven't heard her say 'Hello' more than twice in the time she's been in the shop. Usually she just grunts or hangs upside-down and honks." The deep blue of Tara's feathers shimmered in its cobalt brilliance in the afternoon light streaming through the shop's floor to ceiling windows from the sun beginning its descent into Elliott Bay. One enormous paw grasped her perch. Head tilted sideways, she held a wing up in front of her like a Roman shield, with her burning black eye peering over the top of her wing. She grasped one of her trailing flight feathers with her other paw. "Hello," she said. "What did you say her name was?" "Princess Tara. And she really is a princess. Her parents are a Duke and a Duchess." "So is she a parrot? Or a macaw?" Charlie replied, "All macaws are parrots, son. But not all parrots are macaws. Macaws are the largest of the parrots. There's something like 360 species of parrots on six of the world's seven continents." At least it was 'son' now. Guess that was better than being called boss. "Of those 360 species the largest fifteen or so are macaws. And the princess here is a Hyacinth macaw. Ano - dor - hynch - us hyacinth - in - us. That's the Latin for it. Just love saying that. Ano - dor - hynch - us hyacinth - in - us. Hyacinths are the very largest of the macaws. Tell the truth boss, don't think there's a larger parrot anywhere in Seattle." Okay. "I'm really just looking," I replied. "Someone told me I needed to come see this bird." I noticed there was no price sticker on Tara's cage, unlike all the other cages I could see. "You married boss?" Charlie asked. "Married?" I replied to his query with a question mark, trying to give myself time to figure out if this was a conversation I wanted to continue. Charlie could see he was losing me. "Women love parrots, is all. And women really like guys with parrots. I should know. I've got more women hanging over me than parrots have feathers," he grinned, revealing a pressing need for dental work. Yeah sure, ya betcha, I thought to myself. This conversation was getting noticeably unsettling. I moved to the side to get a better look at the parrot. Or a better look at the door, whichever came first. Tara's head turned in response to my moves to keep her coal black eye fixed straight on me. I started feeling a little bit uncomfortable, and turned to see just how far I was from the shop's entrance. Charlie opened the door to Tara's cage and stuck his arm into the cage. Brave, I thought. "Step up," he ordered the parrot. She stayed motionless on her perch. "She's particular about who she likes," Charlie noted. After hesitating momentarily, the parrot stepped onto Charlie's arm and then quickly ran up on his shoulder. Without a pause, Tara morphed into a study of grace in motion. Before I could react, let alone step out of her way, she jumped off Charlie's shoulder and with a couple of graceful flaps of her two foot long wings, settled onto my shoulder like she belonged there. I felt strangely unconcerned about that giant beak next to my nose. "Hello." "That's different boss," Charlie said. "She likes you." Now what? I thought. 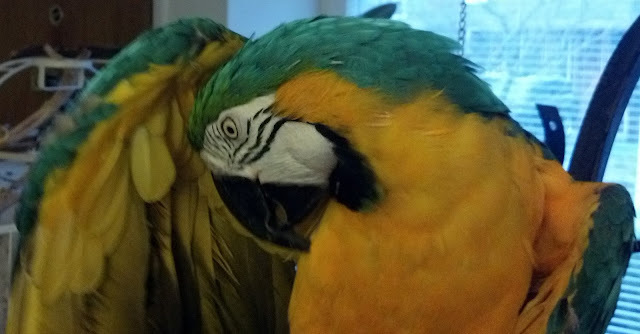 "What do I do now," I asked Charlie as Tara placed her beak against my cheek. "You are mine," Tara whispered into my ear, or so I thought I heard her say to me. "Did you hear that?" I asked Charlie. "Hear what?" he replied. He seemed genuinely surprised at the parrot's reaction to me, seemingly as mystified by her behavior toward me as I was.